Nils H. Lovin (born Nils Hansson and sometimes spelled “Nels”) was one of Bismarck’s leading local builders from 1893 until his death in 1932, constructing numerous residential, commercial, and government buildings of the era. Lovin also served on various local governing boards, including the city commission and planning commission. Postmortem, his sons Oscar and Carl continued in the contracting business until, at least, the 1950s. Lovin was born in either Löderup or Ingelstorp, Sweden in 1866 and grew up in Ystad. At age 21 or 22, he immigrated to the United States and settled in Saint Paul, where he first entered the construction and contracting business. It was there that he met his future wife, (Ingrid) Annie Lindhal, who was serving as a maid in the James Hill House. 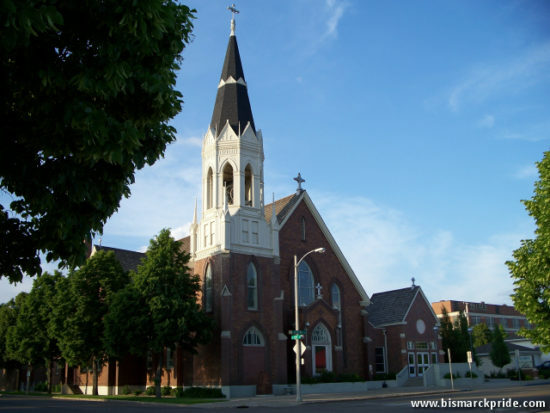 Annie’s family originally settled in Red Wing, Minnesota upon immigrating from Sweden. Lovin moved to Bismarck in 1893 upon winning a construction bid. That same year, he married Annie Lindhal. Until 1901, Nils was partnered with Matt Glineburg and jointly operated under the name “Glineburg & Lovin.” His sons, Carl and Oscar, later joined Nils in the business and continued until at least the 1950s. His sister and her husband, Mary and Johannes (John) Carlson, joined Nils in Bismarck upon immigrating from Sweden in 1901. They were not involved in the contracting business. John was a dairy farmer. Among the most noted buildings constructed by Lovin were Saint Mary’s Church, the Wards Building, and ongoing projects at the state penitentiary and Fort Lincoln (now UTTC). For some time, the Lovins held an exclusive contract for all Standard Oil stations in the region (as seen in the picture). A master at decorative crown-molding and wood carving, Lovin often lent his talents to other local builders. In 1999, his daughter-in-law, Carl Lovin’s widow, donated an estimated $85,000 worth of furniture handmade by Nils Loving to the Bismarck Art & Galleries Association. Lovin also held contracts outside of Bismarck. 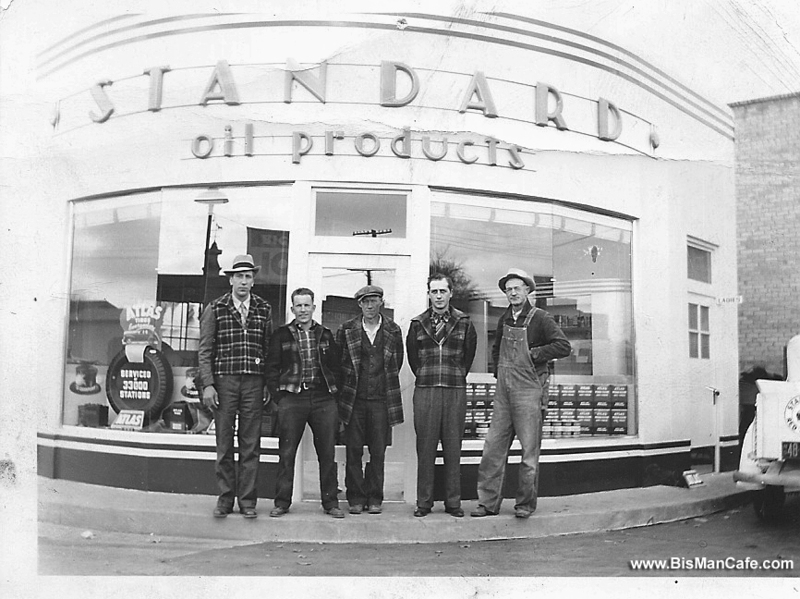 In addition to the Standard Oil stations, one specific example includes a bank and P.C. Remington drug store in Wilton. He also held the contract for a bridge near Sterling. During the Great Depression, Lovin maintained his entire workforce even when there was no work to be had, paying with his personal finances. Lovin died in January 1932 of a cerebral hemorrhage from complications of a stroke that had paralyzed his right side. He was survived by his wife and their two sons. On a personal note, I am proud to say that Nils Lovin was my Great-Great Grandfather. He is one of the biggest reasons I am so passionate about the city. Sorry, but I don’t have a list of all of the properties. The era certainly makes it possible. I read this article about Nils Lovin. I am living in Sweden and are doing some research about my ancestors. Nils (his surname was Hansson before he toke the name Lovin) is my grandmothers (on my fathers side) fathers brother. He was born in Southern Sweden (Löderup) and was the youngest son. He had three brothers and one sister. The two oldest sons stayed in Sweden and the rest emigrated to America. I think his sister Marry Carlsson also settled in Bismarck ND. His brother Ola also moved to America but have not been able to trace him. I would like to get in touch with his relatives so I may learn more about him and his family. I may also share information about his origin in Sweden. Looking forward to learn some news. Nils Lovin was my Great-Great Grandfather. I was always told that Nils, my ancestor, was born in Ystad, Sweden. That’s also what was listed in his obit. But, it looks like Ystad is very close to Löderup. Despite the slight difference in birth city, I do believe it’s the same Nils Lovin who was my ancestor. There are just too many connections not to be. First, the Hansson mentioning is interesting. Nils was quite a prolific artist and signed his earlier drawings as either Nils Hansson or Nils Hanson. Prior to relocating to Bismarck, Annie, his eventual wife, worked for James Jerome Hill – a famous railroad executive in Saint Paul, Minnesota. Many of Nils’ early drawings are of Hill’s house, while he waited for Annie to get off from work. Nils had one other son, Oscar, who was my Grandmother’s grandfather. Nils was a local city commissioner, planning commissioner, and one of the leading building contractors of his time. Many iconic local buildings he built still stand today. I don’t know much more about his personal history other than that what I have in the article or mentions here. Reach out to me direct at randy394@msn.com if you have more questions or comments.